This new and exciting business gives me the opportunity to be involved in the one sport I love most. The game of Hockey! Surf our site and ask yourself if you’ve ever seen anything like it? Kids will smile from ear to ear, parents and grandparents will shed a tear! I’ve made customs for customers all across North America, the time is now. Get your order in and let me build a memory. Send us 5 or more pictures of you in action. We work together to make get the look just right. We offer secure payment options through our web store. We will ship your action figure to your home where it will provide a lasting memory. 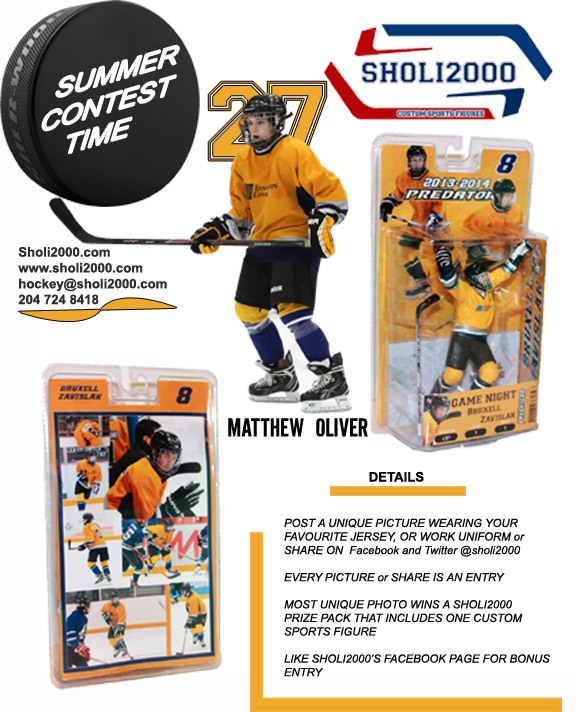 At Sholi2000.com Inc., we recreate that special moment and paint it into a six inch figurine guaranteed to make your player smile! Our figurines are the best gift ever!